booster seats, and seat belts reduces serious crash-related injuries and deaths by about half. Car Seat Check Events & Check Station: Inspection of car seats with certified technicians and law enforcement. Operation Safe Kids: Car seat education for professionals including law enforcement health care professionals and child care providers. Gift of a Mother’s Love: Special gift basket and a child car seat for the first child born on Valentine’s Day in Riverton and Lander. **Injury Prevention Resources will no longer distribute car seats, but will be available for free car seat inspections on Monday's from 1:00 p.m. to 5:00 p.m. Please call for an appointment 307-856-2821 Extension 15. There are three basic types of child safety seats: Infant, Convertible/Forward Facing, and Booster. Infant only child safety seats are often the first type of seat a caregiver will use for their child. Infant only child safety seats provide lower height and weight allowances and may be the most appropriate child safety seat for your infant. Children should ride in a rear-facing infant seat until they reach the weight or height limits allowed by the manufacturer. Convertible child safety seats may be used once a child has outgrown the infant only child safety seat based on height or weight. Convertible seats allow caregivers to prolong the rear-facing position as they are capable of being placed rear-facing and forward-facing. Children should remain rear-facing until they reach the maximum weight or height limits set by the manufacturer. Children can then be placed in a forward-facing position. Booster seats are the final step before your child can use the vehicle seat belt alone. Booster seats come in a variety of styles and are capable of growing with your child. 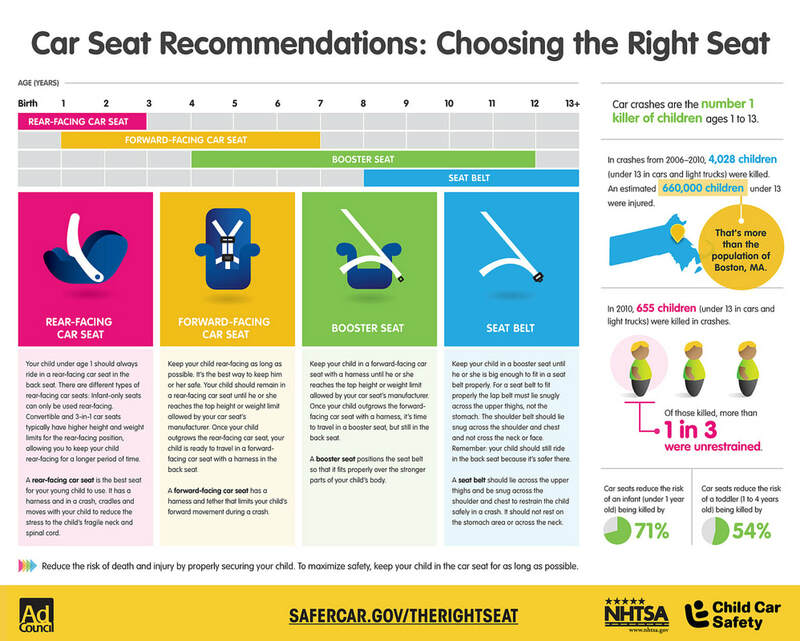 Children should remain in a booster seat using a five-point harness system to the maximum weight or height allowed by the manufacturer before using the vehicle seat belt with the booster. Once your child has outgrown all height or weight limits of the booster seat, the child will be ready to use the vehicle seat belt alone. Children should sit straight against the back of the vehicle seat with knees bent comfortably at the edge of the seat. The vehicle’s shoulder belt should fit snug across the chest and the lap belt snug and low over the upper thighs. One of the most important guidelines to follow when considering what child restraint to use for your child, is the child restraint manufacturer guidelines. These guidelines indicate the child`s minimum and maximum height and weight combinations appropriate for that seat. Each child restraint differs in these guidelines (which are found on the labels and in the owner`s manual). For more information, please visit The National Highway Traffic Safety Administration website at http://www.nhtsa.gov and search "Child Safety".